It was so easy and delicious. I will be making this often. 1 8 ounce package of cream cheese. Most important part of this recipe, is to leave the cream cheese out for a couple hours at room temperature. The cream cheese will become soft and smooth. The importance of this is to create a smooth texture. Not doing so, will create horrible lumps of cream cheese that will ruin the flavor of this pie. After your cream cheese is softened enough, I like to see if it will spread easily with a plastic spatula. In a mixing bowl, mix all before mentioned ingredients. Please note: the lemon/lime juice must come last. The reaction of the citrus juice will start to harden your mixture almost immediately. On the low speed of you hand mixer, blend well. Around 2 minutes of so is plenty, just make sure all ingredients are incorporated. Immediately pour mixture into a waiting graham crust ( (I like to use a vanilla wafer crust instead of graham and I used an 8” cake pan. Recipe below.) ) or for those of us that can't have the gluten, I opt for muffin cups. Refrigerate for an hour to and hour and a half and viola. Mix both ingredients until it sticks together. Punch onto sides of cake pan to resemble a crust. To make this recipe your own, there are several things you can add. Oreo cookie crust. Incorporate a few of the cookies in to the batter, smashed of course. Top with a few whole or halved cookies as well. Fresh strawberries, with or without glaze. I like to cut the strawberries up in to quarters and place in a zip-lock bag. Gently whacking the bag of berries on the counter a few times to start releasing the juices. A half an hour later, you have a no fuss, no extra sugar strawberry topping and glaze. Although a little vanilla in bag wouldn't hurt anything. Key lime juice instead of regular. 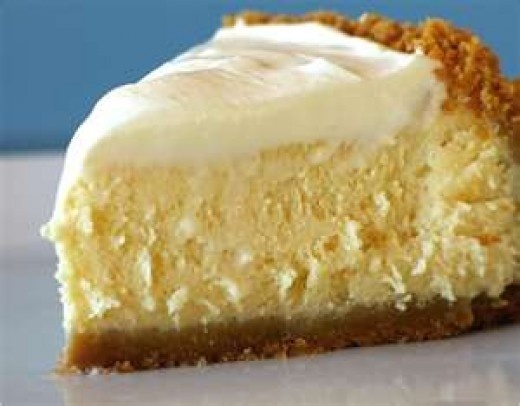 This will give you a tart cheesecake, more like a key lime bar if you lessen the cool whip content. About half is needed for recipe, although the more that is used, the lighter and fluffier the taste and texture will be. So enjoy your cheesecake, however you add your personal touch. Everyone will love this recipe. As a side note, my sister in law is allergic to most food colorings. This was the first cheesecake she was able to eat. If you have fat content issues, you can always use fat-free cream cheese and fat-free cool whip to lessen the fat blow.